This document describes the changes made to the book since its original release. The document is up-to-date as of the version released on April 15, 2019. We try and release an updated version weekly, usually on a Friday unless something like a major conference disrupts our ability to produce an update. This table only serves as a rough approximation of where the book’s content has changed. The number of individual changes or additions of new text within a chapter might be far higher. We have released 13 updates for the 2019 edition since its publication: 7 July, 14 July, 28 July, 4 August, 28 August, 20 September, 19 October, 16 November, 14 December, 21 January, 18 February. 15 March, 15 April. 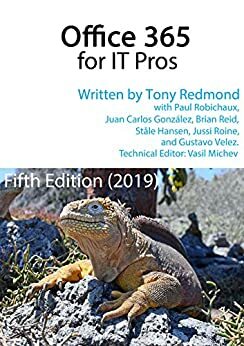 Individual Chapter Changes for Office 365 for IT Pros, 2019 ed. Multi-geo capabilities are now available for SharePoint Online and Office 365 Groups. New logos are available for Office 365 apps, so we updated Figure 1-4. General refresh following periodic technical edit pass. Added note about Exchange organization configuration. Revised advice about transferring large mailboxes to EXO. General refresh, including update for multi-geo availability for SharePoint Online and OneDrive for Business. Added section on integrating Search for Bing with Office 365 sources. Teams personal chats with names capture the name in compliance records. Teams supports Office 365 DLP policies. Teams data services now available from the France Office 365 datacenter region. Teams now used by 500,000 organizations. General update following the GA of Live Events. Updates for new mail flow insights. Added note explaining how to disable processing of retention policies for mailboxes. Added section about flow environments. Added note about how encryption is applied in transport rules to already protected content. Microsoft says that native support for sensitivity labels (for Windows) should be in the click to run Office apps in 2H 2019. Added note about how a “cloud exit” might affect Office 365 protected content. Replaced link to Microsoft online map of Office 365 datacenters. Updated sections about Office 365 and Security and Compliance Center roles. Multiple small changes and general refresh. Groups naming policy is now generally available. Teams now supports Safari (11.0 or better) browsers. New table inserted to compare personal and channel conversations. New table inserted to summarize where Teams stores different kinds of data. Microsoft has introduced a new workflow for the creation of teams, so we had to update that text. Note that the Office 365 Groups creation policy controls the ability to create new plans, even if the plan is created in an existing group. Planner now includes the ability to copy a plan (and create a new group). Notes about SRS refined and updates about widgets included in reporting dashboard. Updated section about dealing with quarantined messages. Clarification about using sensitive data types in content searches of Exchange mailboxes. Note that Teams usage reports do not include “Likes” Inclusion of updated section about supervision policies (which now support Teams). Make the point that DLP policies won’t catch sensitive data if it is disguised in some manner. Add link to blog post explaining how to use Flow to automate the approval cycle for new teams. Also, general refresh for chapter. New Information Protection service plans bundled into Office 365 E3 and E5. Updates for sensitivity labels, including a new version of the preview of the unified labeling client. Details of Q2 FY19 results added. New white paper covering how Exchange Online and the SCC meet electronic records storage and management regulations. Fixes for some broken hyperlinks. Added section about preventing bad passwords. Minor updates in section covering Office 365 backups. Added information about Exchange Native Data Protection and why this helps avoid the need for mailbox database backups. General update, including the General Availability of the new UIs for OWA and Outlook mobile. Note about EWS push notifications and the privilege elevation problem discovered for Exchange on-premises servers. Preview of one-time passcode authentication is now available for Azure B2B collaboration. Clarify that draft Teams messages are not captured for compliance purposes. Teams now supports a limit of 5,000 members per team. Teams supports status messages for users. Minor changes in section about processing groups with PowerShell. Planner web app now supports the creation of multiple plans for an Office 365 group. Section added about the retirement of Exchange Unified Messaging. Inserted section about the use of SRS address rewriting in Exchange Online. Inserted information about delayed holds and compliance tag applied mailbox property. Microsoft has completed the deprecation of the MessageBind audit action for Exchange. Office 365 Cloud App Security alerts are now captured in the audit log. Updated Figure 24-4. Also noted that Outlook desktop can sign into rights management with multiple tenants. Inclusion of reference to Microsoft prototype transport rule for email encryption if content includes sensitive data types. MyAnalytics is now available to E3 plans. 3DES cipher retired from 28 Feb 2019. Add link to POC version of Microsoft’s Network Performance tool. Bad hyperlink for attributes synchronized back to on-premises AD fixed. Password administrator role renamed to Helpdesk administrator. Updated section on sending email with PowerShell – important note here is that authenticated client submissions now create copies of sent mail in Sent Items folder. Updated section about mail contacts. General refresh to update SharePoint content for recent announcements and changes. Added new section about the Microsoft Authenticator app. Added detail about how to track the hard-deletions of Office 365 Groups. Inserted PowerShell example to show how to report the teams someone belongs to. Added another example of how to post cards to a team channel or group using the webhook connector. Included information about Teams for frontline workers app. Clarify the types of links that can be attached to a Planner task. Planner is now available to tenants in the U.S. Government cloud. Updates for Teams meeting room licenses, common area phones, and other topics concerning Teams meetings. 3DES cipher retired from 28 Feb 2019. Added detail about using PowerShell to work with Office 365 retention policies and labels. Changes to the audit operation logged when retention labels are applied to documents. New MailItemsAccessed event for mailbox auditing. Added more detail about extracting events from the audit log with PowerShell. The DecryptAttachmentFromPortal IRM setting is deprecated. Also specified what happens when protected email and attachments are sent to Office 365 recipients such as Teams channels. Note that the free version of Azure AD used by most Office 365 tenants has no SLA commitment from Microsoft. Rewrote section about managing Office 365 MFA with PowerShell. Notes on running PowerShell core on Linux and some RBAC bugs. Emphasize that Search-Mailbox returns a maximum of 10,000 items at a time. Emphasize that if a user has Send As and Send on Behalf Of permission for a mailbox, Exchange uses Send As. Add information about including guest accounts and Team channel email addresses in distribution lists. General refresh, including new sharing control for file downloads. New synchronization protocol for Outlook for iOS and Android. New ribbon for Outlook desktop. New UI for Outlook mobile. Microsoft has started the roll-out of code to store files created in new-style Yammer groups in SharePoint. You now add tabs to a personal or group chat. Etiquette section updated. Rewrote the Personal Chats section to clarify and expand the discussion. Updates to cmdlets in the Teams PowerShell module (0.9.6). Added some clarifications in different sections. Some rationalization coming for the Encrypt Only button in Outlook clients. Some clarifications to the text about sensitivity labels. Added note about using autosignature products when email is protected by rights management encryption. New Figure 24-1 added to position Office 365 and rights management. Added note about configuring AIP and Outlook to use S/MIME to protect messages. Adobe Acrobat integration with AIP is now generally available. Included new Office 365 numbers from Microsoft Q1 FY19 results. Microsoft is developing migration tools to move G Suite data to Office 365. SLA performance for Q3 CY18 added. Accounts assigned Teams Service Administrator role can now create new Office 365 Groups when group creation is restricted. Updated section on using PowerShell to manage Azure AD. Added section about protocol authentication policies. Removed section about searching for mailbox events. Now in 21. Azure B2B Collaboration policy is now managed in Organizational Relationships section of Azure AD portal. Added note about Teams spell check dictionaries. Added note that Teams ignores the Azure B2B Collaboration policy deny list if guest users already exist in AAD. Windows S client is deprecated and due for retirement on November 29, 2018. Dynamic Teams are now formally supported. Teams mobile clients now expose organizational information for the home tenant. Many other small changes throughout chapter. Remove reference to Teams Windows S client. General review of the text and many changes made to reflect the current state of the Skype for Business Online to Teams transition. Rewrote section about removing retention labels. Added detail about audit records logged for automatic label application. Inserted example of searching Office 365 audit log for email events. Added details about DLP rules and confidence levels. MAJOR UPDATE: The information about working with rights management templates and Azure Information Protection labels that used to be in this chapter is moved to the companion volume and replaced with information about Office 365 sensitivity labels. Microsoft now includes LinkedIn revenues in the commercial cloud segment. Microsoft 365 roadmap now available to replace the Office 365 roadmap. New guidance for TLS 1.2 support in Office 365 post Oct 31, 2018. Added Q2 SLA figure. How to connect LinkedIn to Azure Active Directory. Discussion about how Azure AD outages affect Office 365. New license administrator role. Teams administrative roles now covered in this chapter. Updated content about Score Score. Added new detail about Exchange Online revealed at Ignite 2018. Added notes about configuring OWA access to 3rd party cloud repositories and VDI deployments. Added section about migrating an on-premises DL to Exchange Online. Added section about how to detect inactive distribution lists with PowerShell. Added details of system registry settings updated by Office click to run installation. Refresh after Ignite 2018. Added section about how Microsoft IT supports Office 365 Groups. New versions of Teams for frontline and healthcare workers. New data from Ignite 2018. The TSBAC console can now manage teams. The Calls button will appear for all users to allow VOIP calls between Teams users. Added section about creating org-wide teams, including checks for Azure AD accounts that won’t be added to these teams. T-Bot replaced by new Teams Help framework. Teams supports Exchange ABPs to limit directory visibility for users. Added note about using the Alias parameter with the New-Team cmdlet. Updated section about creating an All-Employees team. Coverage of version 0.9.5 of the Teams PowerShell module and some changes throughout the chapter because Get-Team can now return all the teams in a tenant. Rewrote message tracing section. Added detail about changeover to TLS 1.2. Office 365 labels are now two types (retention and sensitivity). The latter is a transition from Azure Information Protection labels. Also, some clarification about event-based retention. Office 365 E5 users now retain audit log records for 365 days. Added PowerShell examples for using protection templates with transport rules and DLP policies. Added information about revoking protected messages. Support for protected Adobe PDF documents. Preview of centralized logging for AIP events. The German Black Forest cloud is closing and being replaced by a new datacenter region in 2020. Microsoft has moved to a new platform for publishing Office 365 IP address information. Information about the BOXServiceAccount and other updates. Added explanation about how to find out who can run the Search-Mailbox cmdlet. Also added note about preservation of a user’s contributions to Teams conversations when they leave the company. Amended note about the RetainDeletedItemsFor mailbox property. General refresh and removal of some older text from chapter. Office 2016 MSI support extended to October 2023. Added use case section as introduction to the section covering implementing Office 365 Groups. Most of the admin settings for Teams are now in the Teams and Skype for Business Admin Center. Four new Teams administrative roles can be assigned to control access to options in the Teams and Skype for Business Online Admin Center. Also, minor corrections and additions in other sections. Reference to Teams administrative roles. Possible to script the assignment of default classification label to a SharePoint document library. Also, expanded information about how to interpret the holds applied to user and group mailboxes. Added section on auditing for content searches and eDiscovery cases. Added new sources for audit records. Added warning about truncation of some audit records from Azure Active Directory. Refreshed figures for Office 365 usage reports. You can protect sensitive email with a DLP policy by choosing to apply encryption to outbound messages. Rewrote section on applying custom protection to documents. Microsoft will replace the Office 365 Roadmap with the Microsoft 365 Roadmap in September 2018. Added information about baseline MFA policy and other topics. Rewrote section about using PowerShell to control Office 365 licensing. Added information about what constitutes a major change within Office 365. Rewrite for section about Search-Mailbox. Inclusion of link to set of recognized senders for calendar events extracted from email. Inclusion of section about compromised accounts (linked to Chapter 8 of the companion volume). Updates to the set of available SharePoint site templates. More information about the change in minimum versioning for libraries. Teams data services are now hosted in Canadian, Australian, and Japanese datacenters. Also, Teams has moved to a per-user licensing model controlled through Office 365 plans. Rewrote section on compliance to reflect capture of call detail reports for meetings and chats. Changes to the EmailAddresses parameter for the Set-UnifiedGroup cmdlet. Added script to show how to create an all-employees team. Rewrote section on Teams meetings to include information about creating and managing Live Events. Multiple changes mostly provoked by Microsoft’s decision to make the anti-phish policy from ATP available to all tenants. Additional detail about Teams retention processing. Clarification on licensing requirements for Advanced eDiscovery. Added section on creating a custom sensitive data type. Clarification about features unavailable when you upload protected documents into a SharePoint or OneDrive library. New DecryptAttachmentForEncryptOnly setting available in the IRM configuration. Customer lockbox approver role now available. New workflow to delete users in the Office 365 Admin Center. Modern team sites can be created without being connected to an Office 365 Group. Some UI changes for Office 365 Group creation in OWA, so we updated our figures. Meeting settings for a tenant have been transferred from the Office 365 Admin Center to the Teams and Skype for Business Admin Center. Inserted text dealing with non-English characters in search keywords. Microsoft stores some AAD attributes for user accounts in the U.S. Added number for commercial cloud annualized run rate after Microsoft Q4 FY18 results. Updated statistics about Microsoft cloud network. Microsoft has paused the roll-out of the increase of versions for SharePoint and OneDrive document libraries. Added more text about how to update photos for guest users. Microsoft announced that Teams has reached feature parity with Skype for Business Online. Meetings now support up to 250 participants. Added text to describe how the inline translation of messages feature works. Discussion about how to mark Office 365 Groups as team-enabled. Rewrote section explaining how to apply protection to messages with transport rules and included text to explain how to insert AIP labels with transport rules. Also, technical editor picked up a couple of things that we fixed or improved. Improved the script to report shared mailboxes. SharePoint Online now supports page metadata. Added link to Microsoft Graph training available on GitHub. Rewrote section about Classifications in the Groups policy. Teams supports keyboard shortcuts to zoom in and zoom out. Information about the free version of Teams announced on July 12. Added new statistics for email usage in 2018-2022. Added sections on Mail Flow Insights (new dashboard) and SIR rewriting for P1 addresses to avoid SPF failures on forwarding. Added clarification about tracking holds placed on inactive mailboxes. Be more specific about the audit events generated for SharePoint Online. Also, Microsoft has announced that they will enable mailbox auditing by default within Office 365 by the end of 2018. Tracked down some bad hyperlinks and fixed them. Refreshed some graphics. Fixed some typos and improved some PowerShell. Several updates after a technical review of content that we couldn’t complete before publication. Idle session timeout policy for SharePoint and OneDrive is now GA. Also, 8 new cmdlets are available to help with SharePoint migrations. Added new section covering features that Microsoft has deprecated in SharePoint Online. Microsoft will remove the old OME app from the Apple and Android stores on August 1, 2018. Also, Microsoft is making some changes to EWS for Exchange Online. Added information about how to add photos for guest accounts. Added some extra context about hiding teams from Exchange clients. Microsoft will enable rights management automatically for eligible tenants from August 1, 2018. Also, a change in how Exchange transport processes email sent to Teams channels means that you cannot send encrypted messages to this destination.